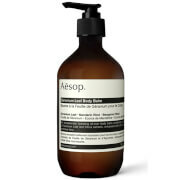 Maintain skin’s silky softness with the Aesop Rind Concentrate Body Balm; a nourishing moisturiser with a mid-weight creamy texture that provides exceptional hydration to leave skin super-smooth and supple. Infusing skin with the crisp, zingy aromas squeezed from a trio of juicy citrus fruit rinds (Orange, Pink Grapefruit and Lemon), the nurturing cream enriches skin with the skin-softening properties from its blend of nut oils. Water (Aqua), d-Limonene, Glycerin, Prunus Amygdalus Dulcis (Sweet Almond) Oil, Stearic Acid, Citrus Aurantium Dulcis (Orange) Oil, Cetearyl Alcohol, Ceteareth-20, Cocos Nucifera (Coconut) Oil, Macadamia Ternifolia Seed Oil, Citrus Grandis (Grapefruit) Peel Oil, Glyceryl Stearate, Citrus Medica Limonum (Lemon) Peel Oil, Aloe Barbadensis Leaf Juice, Phenoxyethanol, Butyrospermum Parkii (Shea Butter), Theobroma Cacao (Cocoa) Seed Butter, Tocopherol, Glycine Soja (Soybean) Oil, Triticum Vulgare (Wheat) Germ Oil, Disodium EDTA, Benzoic Acid, Dehydroacetic Acid, Ethylhexylglycerin, Sodium Citrate, Daucus Carota Sativa (Carrot) Root Extract, Beta-Carotene, Citral, Linalool.